Federica Brignone of Italy earned her first career World Cup win at the season-opening women's giant slalom on Saturday. Federica Brignone earned her maiden World Cup win Saturday, ending a nearly eight-year wait by the Italian women's team for a giant slalom triumph. 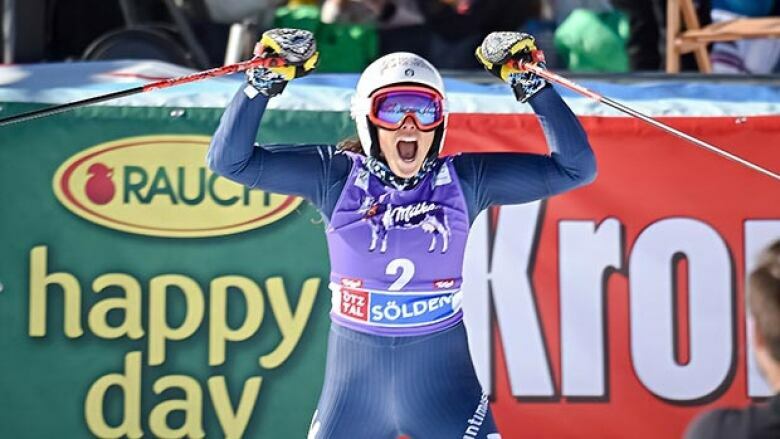 In the season-opening race on a sun-soaked Rettenbach glacier, Brignone held on to a commanding first-run lead to beat last year's winner Mikaela Shiffrin of the United States by 0.85 seconds. "I can't really believe what's happening," said the Italian, who finished in an aggregate time of 2 minutes, 24.27 seconds for her first victory in 99 World Cup starts after seven previous podium places. "It's so great. When I saw the green light in the finish, it was just incredible. The two runs I kept pushing. My legs were burning but it felt so good." The last Italian winner of a women's GS had been Denise Karbon in Ofterschwang, Germany, in January 2008. "That I wasn't on the first place until now is because I didn't deserve to be," said Brignone, who missed most of the 2013-14 season after undergoing ankle surgery. "I've been waiting so long for this victory. I wasn't on the same level as the top skiers but I've worked hard to get there." "Federica absolutely nailed her first run and in her second run she did a really great job as well," Shiffrin said. "I don't think anybody could beat her today." The Italian also led here four years ago but skied out early in her second run as Lindsey Vonn took the win. The American four-time overall champion skipped Saturday's race after having only just recovered from an ankle injury and chose to train super-G instead. Marie-Pier Préfontaine, of Saint-Sauveur, Que., was the top Canadian, placing 15th with a combined time of 2:28.00. Marie-Michele Gagnon, of Lac-Etchemin, Que., finished 25th at 2:29.09. Toronto's Candace Crawford failed to qualify for the second run, while Mikaela Tommy, of Wakefield, Que., did not finish her first run. Also missing were defending overall champion Anna Fenninger, who was ruled for the season after knee surgery following a training crash Wednesday, and Slovenia's Tina Maze, who has taken a year off from racing. "I felt really good with my skiing," Shiffrin said. "It's really hard snow, like icy and a little bit grippy when you ski it. You can push out the snow and it totally came back. I felt like I attacked, and I had more confidence than I had before in GS so it's a good place to start." The 20-year-old American, who has been dominating women's slalom since 2012, has been widely regarded as a main contender for the overall title this season. "Obviously today is a very good start and if my slalom keeps going well, I can make points," she said. "But it's too early to tell and I really don't want to focus on that now." Weirather was also reluctant to reflect on the fight for the overall championship after placing third. She hired the former head coach of the U.S. ski men's speed team, Andreas Evers, in the off-season to make the next step in her career. The Austrian also worked with Hermann Maier. "Hermann Maier was my biggest idol," Weirather said. "When I was looking for a coach, someone recommended him to me." Weirather nearly arrived too late for the first run, having misread the start time. "It was an advantage in the end as I didn't have time to get nervous," she said. The men's GS on the same course is scheduled for Sunday, while the women's World Cup continues with a slalom in Levi, Finland, on Nov. 14.